Bits And Pieces Through The Week.. This lovely copper work is by Hugh at Hugh Murray Restorations near Stroud Glos. 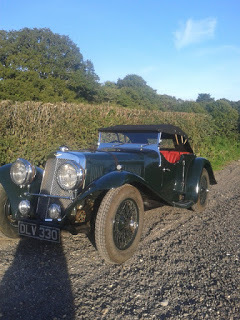 I have been back working through the finishing list of the Delage (featured in older posts in this blog). Every time I (and everyone else it seems) walk through the door, this car gives me great pleasure to see, it is so stunning, in a very understated way. As you can see the colour combination and the amazing woodwork along with those big narrow wheels, make this stylish and dignified car. after all of those years in boxes, that was quite a moment. She is back into the workshop now to have some last details and further brake adjustment as the brakes bed in. We are also doing a precautionary check of the engine bearings because, as mentioned in older posts, the engine was white metalled and machined and built before storage in the early seventies, it does seem to have had a brief run after the build but we feel that was very little. The tolerance of the bearings was quite tight and so we have been checking them at intervals to ensure that they are not overheating or showing any sign of distress as they bed in. The carpenter / cabinet maker has been applying some further coats of oil to the absolutely beautiful woodwork, you can't see in the photos, but the rear seat also has a decking hatch when not in use. 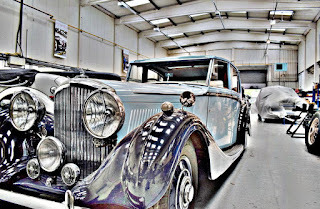 The coachwork has been built by Hugh Murray using the original photos and some original items, Mark has painted her just as the factory, to a wonderful deep, rich, brush coated finish, even though brushmarks are barely perceptible, this gives to the period effect so subtly. Through the late winter and now into spring we have been making some progress on the Gloria's interior. 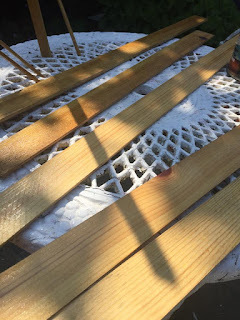 The new wooden sections that provide the backing for the headlining and the door post trim have been cut and have received a coat of yacht varnish to protect them before the hessian and fabric covering. Some sections of the interior wooden frame have missing and rotten "fairing" strips for the headlining to attach and form around. The carpets are in progress from new carpet material. We have been sorting out some fuel leaks from dry cork gaskets and will have the engine running quite soon, this will help us move her from workshop to workshop as we work through the finishing details. More progress and photo updates to follow shortly. 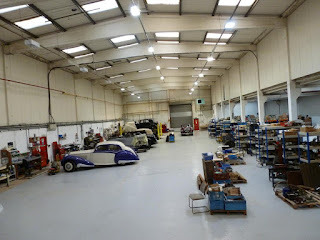 I have recently been a little involved with Fiennes Restoration Ltd.
Fiennes Restoration / Engineering, is where it all started for me 30 years ago. Their engineeing and restoration standards have always been of the highest quality and a benchmark for me. I am very proud to be working, for the moment, with them once again. Do visit their Website (soon to be updated) http://www.fiennes.co.uk/. 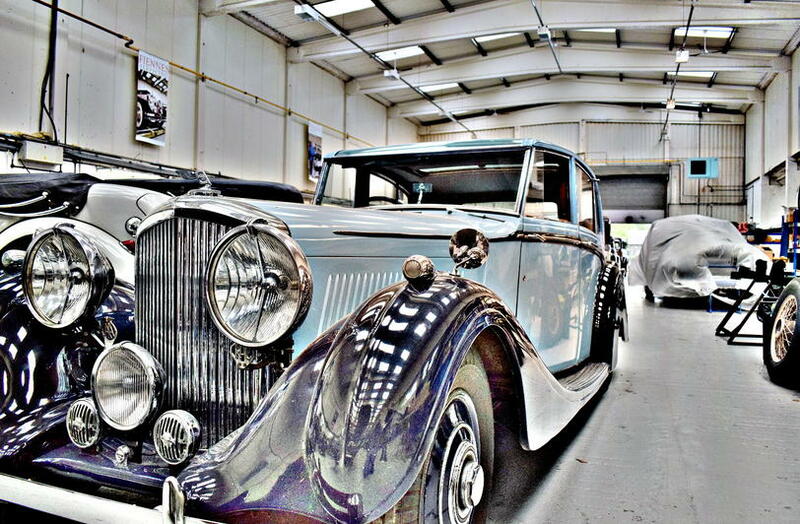 The photos below were taken a few years ago, this large workshop, machine shop and coachbuilding shop is now full of interesting work on a wide range of Rolls Royce, Bentley and many other makes. 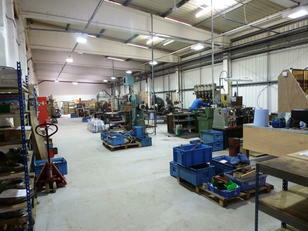 Photos from Fiennes Restoration Ltd web site. This photo is from the 1969 Fairmont Speedway archives, I found it quite intriguing. It seems the car left the track through the fence and on to the railroad! Machine a dummy proving piston for the initial test machine work and to test the piston mounting jig. Taking some clay impressions to test piston to the edge of the combustion chamber clearance ad to test valve clearance. Piston mounted in the machined Jig / mounting plate. Head test fit with two valve rockers for clearance tests. Engine test fit for linkages. Drilling and wires for new switches. Changes and Ups and Downs! As you may have seen in a previous post we had moved from the picture postcard Avenue Garage to new very modern premises a month ago. Unfortunately the new arrangement did not go quite as planned and so a decision was taken to regroup to the area that I know and enjoy the most, we have returned to solely vintage and classic work and are now moving into simple, quiet, small and comfortable premises just outside of Swanage to resume as we were 2 1/2 years ago. We would very much like to thank all of the modern vehicle customers that supported and welcomed us without any waver during this two and a half years, we certainly remained extremely busy with such kind support. We may also have a new interesting development as we look ahead, "as one door closes another opens". More on this news a little later. Please continue to visit this blog as I think the amount as well as the "more interesting posts" will begin to increase.